Ingredients: Beef, beef broth, water, sea salt, encapsulated citric acid, brown sugar, celery juice powder, black pepper, red pepper, dehydrated garlic, coriander. The first flavors to come in is a beefy, summer sausage with a well-noticed black pepper. A vinegary tanginess comes in followed by a faint bit of heat. The saltiness feels a bit higher than most other small market brands I've tried. There's also a lightly acrid aftertaste that comes in after the swallow. 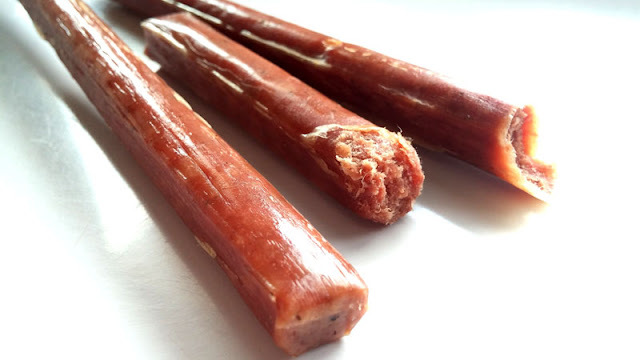 The chewing feels soft, tender, yet with a moderate beefiness, very much like what one would expect from a beef stick. There isn't any "snap" when biting off a piece. However, the meat is smooth, well blended, with no hard bits or stringiness. 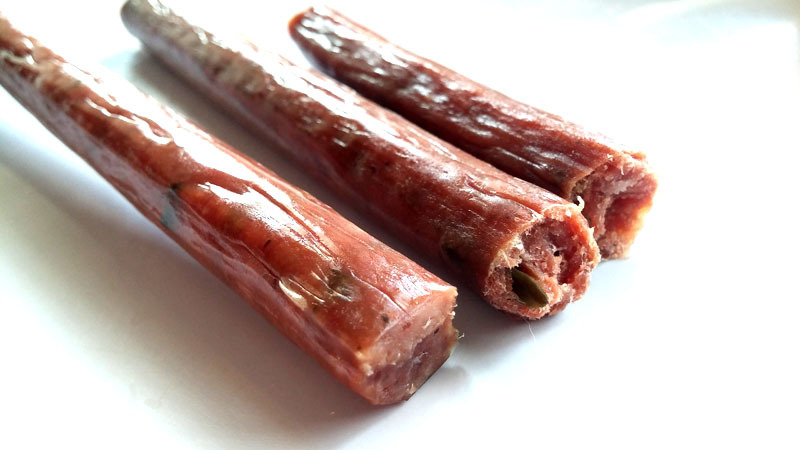 The first flavors to come in is a beefy summer sausage plus jalapeno. The saltiness remains at the same level as the Original. The vinegary tanginess is also there. The level of heat feels a bit higher than the Original, but still not really that hot. It rates a "mild medium" on my heat scale (level 2 out of 5). For being marketed as "Jalapeno" it definitely delivers a lot of jalapeno flavor, with a low, but noticeable, heat. The chewing feels much like the Original, perhaps just a bit more beefy chewing, but that's likely a subtle difference from one batch to another. 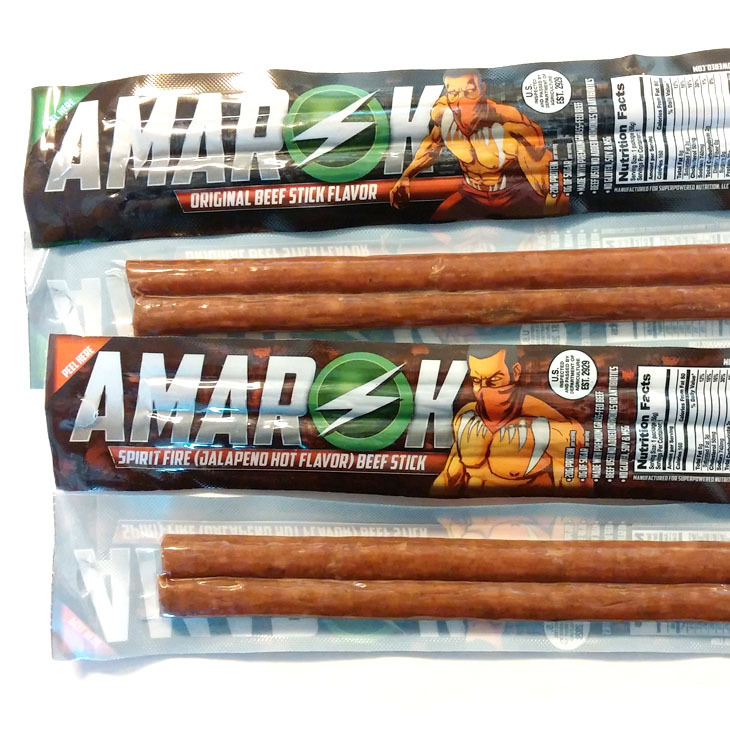 Amarok Beef Sticks offers what tastes and chews like normal, everyday beef sticks, but with the specific promise of being gluten free, grass-fed beef, and a high 20 grams of protein per stick. I do like the stronger jalapeno flavor in the Spirit Fire variety, considering most national brands water down their spicy sticks. 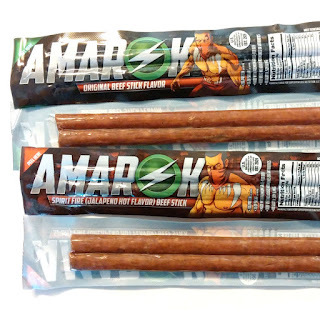 If you need more muscle to fill out those superhero leotards you bought at the last ComicCon, these sticks are a great, and delicious, way to build mass without the costly expense of protein powder.